LNG Trucks and Biogas Buses - Breaking News! Biogas buses, and biogas powered trucks are catching on, even if most will be LNG, which will be supplied from fossil fuel sources, for now. What could be better than using biogas from the anaerobic digestion process to power transport fleets? The energy source is renewable, usually made from waste by-products, and the methane used in this fuel is clean burning, and removes the concerns for air pollution which come from using diesel to power trucks and buses. Add to this that most governments charge a far lower tax rate for using it than oil and petrol (gasoline). Then also consider he fact that the fuel itself does not need long distance transportation, creating carbon emissions even before it is used, and you have a win-win fuel to use! We would like to share with you three articles on the subject as follows. The first three provide case study examples of projects and fleets where LNG (Liquid Natural Gas – not biogas) is being used to fuel trucks, and biogas is being used to fuel buses. LNG is not necessarily renewable, but biogas when upgraded to biomethane is being added to LNG networks. The first one is all about Finland as a world leader in low carbon emission transport fuel use. So, by reading that you will find out about the over 30% rise in use of LNG fuel in that country, last year. Speed Oy, a specialized container transport company based in Helsinki, Finland, has decided to introduce a Liquefied Natural Gas (LNG)-fueled Volvo FM 460 hp dual-fuel truck to its fleet operating from Helsinki’s Vuosaari Harbor. 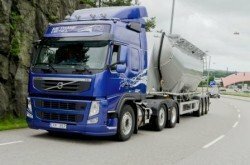 An LNG refueling station for heavy-duty vehicles will open at the harbour in August by Gasum, a Finnish gas company intent on developing the road fuel gas filling station network enabling the use of LNG in heavy-duty transport. ”We want to lead the way in the transport sector and introduce new, more environmentally friendly vehicles to our fleet [biogas trucks]. LNG is a natural step in our efforts to make transport greener. We’ve already been involved for four years in an Eco-Truck trial where large-capacity modular combination vehicles are operated under a special permit granted by the Finnish Transport Safety Agency (Trafi). The results are promising: carbon dioxide emissions have been cut by more than 40%. We’ve received encouraging feedback about the Eco-Truck from our environmentally responsible customers, and therefore I believe that the number of Speed’s LNG-fueled vehicles will also increase in the future,” says Managing Director Tuomo Vallas Speed Oy. 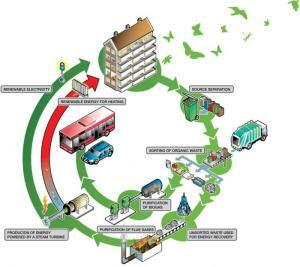 “Speed is setting an example for other transport companies by offering cleaner container transport. LNG is an excellent alternative for use instead of diesel for heavy-duty transport and can help reduce emissions,” says Gasum Sales Manager Petri Michelsson. “Volvo wants to be actively involved in progress, and by participating like this we’re able to build and develop the truck sector for better service to our customers and society in the future while at the same time operating in line with our core value of environmental care. This also helps us make sure we have the best competencies and knowledge in the sector as regards new technologies and products,” says Kimmo Ahonen, Director, Vehicle Sales, Finland, Volvo Trucks. Transport operator EMT Madrid (Empresa Municipal de Transportes de Madrid, S. A. ), the public transport company that services the needs of the Spanish capital 3.2 million inhabitants is a long-time user buses with natural gas engines. So far, the use of NGVs has made it possible to cut emissions by over 80 per cent. At the end of May, EMT placed an order for 82 more alt-fuel buses, choosing the Mercedes-Benz Citaro NGT (Natural Gas Technology). The order consists of 40 18-metre Mercedes-Benz Citaro natural-gas-powered articulated buses and 42 12-metre Mercedes-Benz natural-gas-powered rigids. The new Citaro NGT with natural-gas engine is approved without restriction for the use of renewable natural gas to DIN 51624. This makes for an even smaller carbon footprint, as operation of the natural-gas bus then becomes virtually CO2-neutral. In addition, the noise level of the natural-gas engine is noticeably lower than that of a comparable diesel engine. Depending on the driving status, its noise emissions are up to 4 dB(A) lower, which corresponds to the subjectively perceived noise level almost being cut by half. 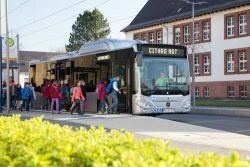 Both factors – low CO2 emissions and low noise level – make the new Citaro NGT especially suitable for service in busy inner cities as well as residential areas or old-town districts with high numbers of tourists. In Madrid, the new natural-gas buses from Mercedes-Benz will operate in the city, including on one of Madrid’s main avenues, the Paseo de la Castellana, which is in the centre of the Spanish capital. 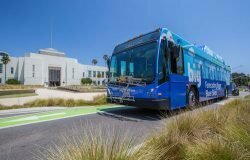 Clean Energy Fuels Corp., a major provider of natural gas and renewable gas for transportation fuel in North America, has been awarded a multi-year contract by the City of Santa Monica to supply liquefied natural gas (LNG) for the city’s Big Blue Bus (BBB) fleet of vehicles. The 5-year deal, worth an estimated $3 million per year, will enable BBB to continue using Clean Energy’s Redeem™ brand of renewable natural gas (RNG), rated up to 90 percent cleaner than diesel and considered the cleanest transportation fuel available. BBB, which began using Redeem™ by Clean Energy in January 2015, was one of the first transit agencies in the nation to contract for RNG and will also become one of the first agencies to incorporate the new Cummins-Westport 8.9L ISL G Near-Zero 0.02 NOx engine, the first mid-range engine in North America to receive emission certifications from both U.S. Environmental Protection Agency (EPA) and Air Resources Board (ARB) in California that meet the 0.02 g/bhp-hr optional Near Zero NOx Emissions standards. Big Blue Bus, which includes 200 natural gas buses, plans to replace over 100 of their existing bus engines with the new Near-Zero natural gas engine over a three-year period, making BBB one of cleanest transit agencies in the nation. When the transition is complete, BBB is expected to have reduced their NOx emissions by over 90 percent and their GHG emissions by 8,000 metric tons annually.